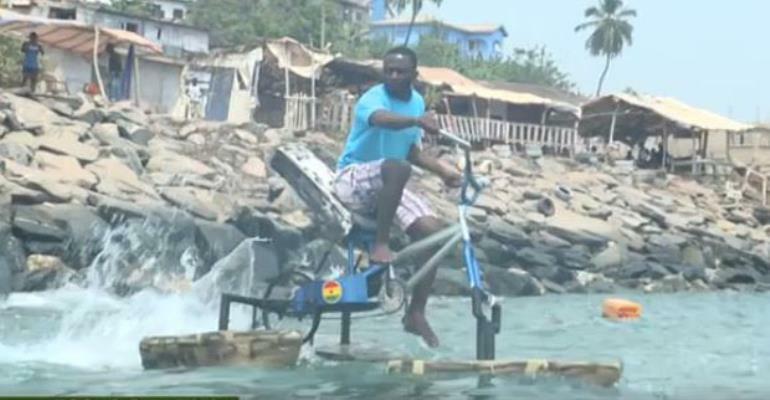 The Takoradi Technical University (TTU) has granted full scholarship to Frank Darko, a student of the university who has invented the water bicycle to help address the challenges of school-children, particularly those in the hinterlands, who have to cross rivers daily before getting to their schools. According to Darko, he invented the water bicycle because he was saddened by a documentary he watched which showed some school-children swimming across a river to get to school. Frank Darko, who was pursuing Graphic Design at the University, had to defer the course due to financial challenges. At a brief ceremony to announce the scholarship, the Vice Chancellor of TTU, Rev Prof John Frank Eshun, explained that the offer of the full scholarship to the student is to encourage him to do more innovative things to solve challenges in the Ghanaian society in particular and the world at large. He indicated that the university was ready to give scholarships to students who show interest in innovations. Rev Prof Eshun expressed happiness about the invention and added that the university would take up the project, and in collaboration with the student, improve it to stand the test of time. He revealed that the university had established an entrepreneurial and innovation incubation centre to assist students with various talents to evolve it into a business venture to help solve the high rate of unemployment. In a related development, management of TTU has established a 100,000.00 scholarship scheme to help needy but brilliant students to successfully complete tertiary education. The scholarship formed part of the university's social responsibility in ensuring that brilliant children from underprivileged families have equal access to quality higher education. The Vice Chancellor of the University, Rev Prof John Frank Eshun, revealed this at the inauguration of a nine-member committee chaired by the Pro Vice Chancellor, Prof Victor K. B. Micah, to ensure fair administration and allocation of the funds to needy students. According to the Vice Chancellor, the university over the years has explored ways to assist students and other young people within the catchment area in order to access unlimited quality education. “What is the essence of the university if it cannot give back to society and help the very people it seeks to develop for the betterment of society,” he quizzed. Explaining the mandate of the committee, Rev Prof Eshun, indicated that apart from receiving applications for support and determining same, they were to source for additional funds. “The additional funds will help to grow the scheme to include every young person in the country who might need assistance from the university,” he added. He challenged the committee to be fair in the discharge of their duties so that students who really need support would be granted. The chairman of the scheme, Prof Victor K. B. Micah, pledged to work hard with the other members to ensure equity and fair administration of the funds.